Ernest Edward Mills Joyce AM (c. 1875 – 2 May 1940) was a Royal Naval seaman and explorer who participated in four Antarctic expeditions during the Heroic Age of Antarctic Exploration, in the early 20th century. He served under both Robert Falcon Scott and Ernest Shackleton. As a member of the Ross Sea party in Shackleton's Imperial Trans-Antarctic Expedition, Joyce earned an Albert Medal for his actions in bringing the stricken party to safety, after a traumatic journey on the Great Ice Barrier. He was awarded the Polar Medal with four bars, one of only two men to be so honoured, the other being his contemporary, Frank Wild. Joyce came from a humble seafaring background and began his naval career as a boy seaman in 1891. His Antarctic experiences began 10 years later, when he joined Scott's Discovery Expedition as an Able Seaman. In 1907 Shackleton recruited Joyce to take charge of dogs and sledges on the Nimrod Expedition. 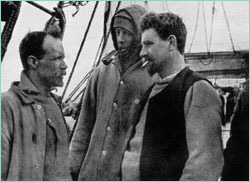 Subsequently Joyce was engaged in a similar capacity for Douglas Mawson's Australasian Antarctic Expedition in 1911, but left the expedition before it departed for the Antarctic. In 1914 Shackleton recruited Joyce for the Ross Sea party; despite his heroics this expedition marked the end of Joyce's association with the Antarctic, and of his exploring career, although he made repeated attempts to join other expeditions. Throughout his career Joyce was known as an abrasive personality who attracted adverse as well as positive comments. His effectiveness in the field was widely acknowledged by many of his colleagues, but other aspects of his character were less appreciated – his capacity for bearing grudges, his boastfulness and his distortions of the truth. Joyce's diaries, and the book he wrote based on them, have been condemned as self-serving and the work of a fabulist. He made no significant material gains from his expeditions, living out his post-Antarctic life in humble circumstances before dying in 1940. These Greenwich buildings, now the National Maritime Museum, housed the Royal Hospital School for Navy Orphans during Joyce's childhood. Joyce's Naval Service Record show his place and date of birth at Feltham, Sussex, 22 December 1875. . Kelly Tyler-Lewis, in her account of the Ross Sea party, quotes a newspaper report giving Joyce's age as 64 in 1939, indicating birth year as 1875 – although she also gives his age as 29 in 1901, suggesting an earlier birth year. Joyce's father and grandfather had both been sailors, his father probably within the coastguard service. After the father's early death his widow, with three children to support on her limited earnings as a seamstress, sent the young Ernest to the Lower School of Greenwich Royal Hospital School for Navy Orphans at Greenwich. Here, in austere surroundings, he received a vocational education that would prepare him for a lower-deck career in the Royal Navy. After leaving the school in 1891, he joined the navy as a boy seaman, progressing over the next ten years to Ordinary Seaman and then Able Seaman. Joyce had blue eyes and a fair complexion, with a tattoo on his left forearm and a scar on his right cheek. He was not a tall man, only 5' 7" in height. .
British Naval Archive Records at Portsmouth - No: 160823 - provide full details on Joyce’s early naval service. This commenced in May 1891 as a Boy Second Class on the St. Vincent, and over the following ten years he served on a number of ships; the Boscawen, Alexandra, Victory 1, Duke of Wellington, etc. . In 1891 he was serving on HMS Gibraltar in Cape Town where, in September, Scott's expedition ship Discovery stopped on the way to the Antarctic. Scott was short-handed, and requested volunteers; from a response of several hundreds, Joyce was one of four seamen chosen to join Discovery. He sailed south with her on 14 October 1901.